I was eleven years old when I first saw Dynasty Warriors. It was the last day of school, someone had brought in their brand spanking new Playstation 2 and knocked out a few rounds of Dynasty Warriors 2. They played the Yellow Turban Rebellion level, Sun Shang Xiang confronted them, and I fell in love. It is many years later and Sun Shang Xiang is still my go to character when I start a new game. Dynasty Warriors (and later Kessen 2) fostered a love of a period that I probably wouldn’t have been exposed to, otherwise. The not entirely historically accurate Dynasty Warriors series is based on the novel; Romance of the Three Kingdoms. Written by Luo Guanzhong in the fourteenth century, Romance of the Three Kingdoms documents and dramatises the Three Kingdoms period of China’s history, a period of just over a hundred years that saw the land ravaged by war as competing feudal lords fought for power. The novel draws together history, legend, myth and fiction and is considered one of the most influential works of Eastern literature. The Dynasty Warriors series first appeared in 1997 as a fighting game, but since then has become a tactical/action/hack ‘n’ slash with a number of spin off titles. The Three Kingdoms is noted for the sheer number of celebrated heroes who came to the forefront of history, many of whom appear as playable characters in the games. Even though women at this time generally received much less coverage than men, especially during a time of war when men engaged in fighting while women acted as dynastic alliance makers and supporters, Dynasty Warriors does feature a number of playable female characters. It probably won’t surprise you (and if it does, it really shouldn’t) to learn that the women of the Three Kingdoms weren’t riding into battle, laying waste to their enemies with fans, whips and…flutes. They were, instead, integral in alliances and domestic affairs, as we might expect. But this does not relegate them to boring side notes in history, and many of those who participated in the events of the time obviously did so to the extent that they were noted for it, rather than disappearing from the record. 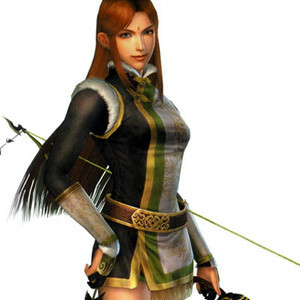 In this series I intend to look at the women presented in the Dynasty Warriors series, their role in the Romance of the Three Kingdoms and other fiction, and finally their place in history and what we actually know of them. In the Games: In their first appearances, the games’ stories have the two Qiaos being rescued from varying antagonists by Wu’s Sun Ce and Zhou Yu, who then marry them respectively. They are both shown to be completely loyal to their husbands and their participation in battles is usually to assist them in their missions. Initially they were both portrayed as rather excitable due to their youth, though later editions of the game had Da Qiao mature, to distinguish her from her more headstrong sister. Both are shown to adore their husbands, while their husbands are fiercely protective of them in return. In Fiction: Both women are said to be exceptionally beautiful and Cao Cao’s attraction to the younger sister, Xiao Qiao, is the dramatic reason given for his advance against Wu at the Battle of Red Cliff (Chi Bi in the games). 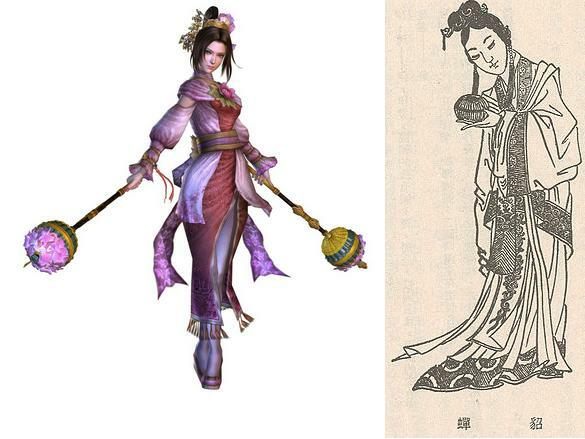 In some fiction they are both talented martial artists which bring them to the attention of Sun Ce and Zhou Yu. In History: Historically, as with most of the women mentioned in the Romance of the Three Kingdoms, very little is known about them, including their names. Although collectively they are known as the Two Qiaos, the names ‘Da’ and ‘Xiao’ simply denote ‘elder’ and ‘younger’. Sun Ce and Zhou Yu were both involved in the Wu conquest of Huan where they met an Elder Qiao who was known for his two beautiful daughters who they then married. Both men died young; Sun Ce at 25 and Zhou Yu at 35, the former with his wife at his death bed. While Da Qiao and her husband had several daughters, it is unknown whether Zhou Yu’s children were by Xiao Qiao. There are rumours in the historical records that some months after Sun Ce’s death, Da Qiao ran off with a Wei officer – Liu Xun. Xiao Qiao is not mentioned again after her husband’s death. In the Games: Zhu Rong is a daughter of a fire God (from whom she receives her identical name) and married to the Nanman king; Meng Huo. She supports her husband in his resistance against northern invaders, usually appearing in the game after he has been captured and released a number of times. Some games have a segment where she personally rescues her husband from capture. Although the couple are usually shown to have a comic relief relationship, she has genuine feelings for her husband and her fiery nature complements his casual attitude. 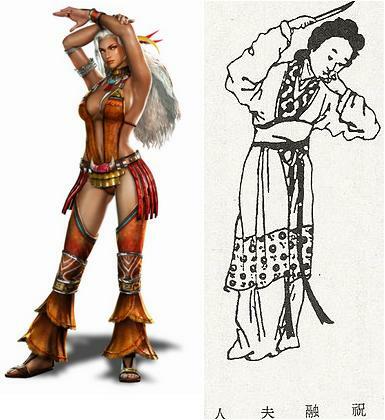 In Fiction: Lady Zhurong is the only woman in Romance of the Three Kingdoms to actually engage in any fighting. She claims her name from the fire God, of the same name, popular in Southern China. After her husband had been captured and released for the fifth time by Shu forces, she personally led a counter attack, capturing two of their generals. She herself was captured twice. In the first instance she was ransomed back to her husband in exchange for the Shu generals she had captured earlier, the second time Meng Huo surrendered to Shu and she was released to him once more. She is shown to be publicly critical of her husband but the two love each other dearly. In History: Zhu Rong didn’t exist. For that matter, many historians doubt whether her husband Meng Huo even existed or whether the story of his seven defeats is mythical. 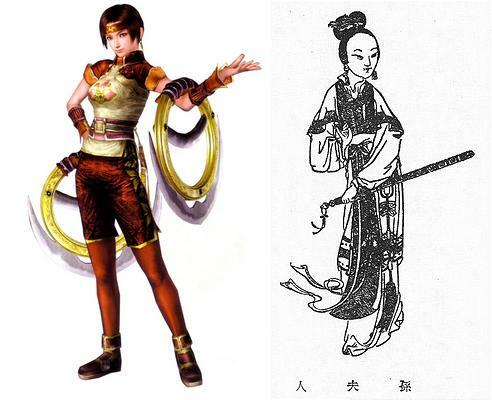 In the Games: Yue Ying is shown to be as intelligent and resourceful as her husband, Zhuge Liang, and her innovative inventions often provide the means for Shu victories. She is utterly supportive and increasingly protective of her husband, protecting his privacy in later games and fighting on his behalf when he is rendered unable. In Fiction: According to myth, Yue Ying spread a rumour that she was ugly, challenging potential suitors to visit her personally. She would then hide her looks by dressing in many veils. When Zhuge Liang visited her, he disregarded her warnings and removed her veils informing her that she was not at all ugly and the two were married. In History: Yue Ying’s name was not known, historically she was known as Lady Huang as her father was Huang Chengyan. While the story of her marriage was popularised in fiction, an ancient biography of Zhuge Liang tells it slightly differently, where her father approached Zhuge Liang assuring him that although his daughter was ugly she had formidable talent. The two married, but this is the only mention of her in any records. In the Games: In the earlier instalments Sun Shang Xiang fights alongside Wu, intent on realising her brothers’ ambitions for the land. From Dynasty Warriors 4 onwards her story tends to incorporate her marriage to the Shu ruler; Liu Bei. She is something of a peace broker between the two maintaining a great loyalty to both Wu and Shu, though her love for Liu Bei is evident from the outset, and in the latest title she stands between her husband and her approaching brother, refusing to step aside. In Fiction: In the Romance of the Three Kingdoms she is known as Sun Ren, while the name Sun Shang Xiang comes from a later opera. In legends her brother Sun Quan and his advisor Zhou Yu planned to use her as bait to capture Liu Bei. They lured him to Jing where he was supposed to marry her, but Zhuge Liang thwarted the plan, Liu Bei and Sun Shang Xiang were married anyway. Another fictional story has her committing suicide in the Yangtze River when she learned of Liu Bei’s death. In History: We know a surprising amount, comparatively about Lady Sun, but her name, place/date of her birth and death remain unknown. She was apparently very much like her brother, Sun Quan, and was attended by female servants all of whom carried swords and other weapons; something which apparently intimidated her husband, later. She married Liu Bei to strengthen her brother’s alliance but her husband was forever distrustful of her, and they aren’t thought to have had any children together. Three years after the wedding Liu Bei went on campaign, leaving his wife at their palace in Jing. Lady Sun not only used this as an opportunity to return to her brother but tried to abduct Liu Bei’s son in the process. She was prevented from taking the boy, and Liu Bei sent her to live in a remote region he controlled. After his conquest of Yi Province, he formally broke their relationship and returned her to Wu, where no further details of her life are recorded. In the Games: Diao Chan is involved in a plot to assassinate Dong Zhou concocted by her adoptive father Wang Yun. The plan involves playing off Dong Zhou’s affections against those of his adopted son and bodyguard Lu Bu, causing the other to become more and more jealous until Lu Bu kills Dong Zhou. Depending on the game Diao Chan either comes to genuinely love Lu Bu or is merely manipulating him to achieve her own ends. In Fiction: As in the game Diao Chan’s role in the Romance of the Three Kingdoms is to sow mistrust between Dong Zhou and Lu Bu. After she convinces Lu Bu to kill his father her story begins to vary. She is either killed by Dong Zhou’s followers or by Guan Yu, who is given Diao Chan after Lu Bu’s eventual defeat. Guan Yu’s reasons for killing her also vary; in one account it is to prevent her betraying him as she had Lu Bu and Dong Zhou, otherwise it is to prevent himself and his brothers-in-arms arguing over whom should marry her. In History: Although regarded in history as one of China’s great beauties, there is no evidence to suggest that she was an actual person. Instead it is thought that her story was inspired by an actual affair that Lu Bu had with one of Dong Zhou’s concubines. 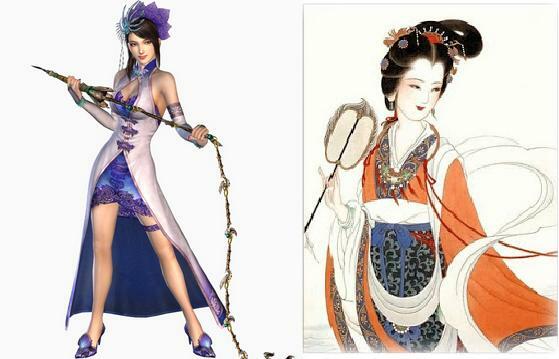 In the Games: Zhen Ji actually appeared as a playable character before her husband; Cao Pi. The games usually show her joining Wei and marrying Cao Pi after her first husband Yuan Xi is defeated at the battle of Guan Du. She is proud and haughty but utterly devoted to Cao Pi, feelings which are returned by her husband. In Fiction: Zhen Ji (literally: Lady/Consort Zhen) appears in a couple of television series and early operas which show an affair on her part with either Cao Cao or her husband’s brother. She is also known as Zhen Luo and features as the legend of the Luo river goddess (hence the name). In History: Probably because she was the wife and mother of an emperor there is a surprising amount of information regarding Lady Zhen’s dramatic life, including her childhood. While we still don’t know her name, we do know a great deal about her life, even before her marriage, and importantly we know dates! So much so that it is thought she died at the age of thirty eight, which is more than what we know about a lot of men at the time. Even in her youth Lady Zhen was known to be a kind girl and was considered an asset to her family. Intelligent and very beautiful she was married to Yuan Xi of the prominent Yuan family. While her husband was on campaign, Lady Zhen remained at his home to care for his mother. After his defeat by Cao Cao, she was found there by Cao Cao’s son Cao Pi who, entranced by her beauty, asked to marry her. As Cao Pi’s wife she showed herself to be exceptionally kind, caring not only for her husband’s family but also his other wives and concubines, something which endeared her to him, though she was also known for her humility. Together they had two children; their son Cao Rui would become emperor after his father’s death. When Cao Cao died, the now emperor Cao Pi, favoured another concubine, Guo Nuwang, over Lady Zhen. Apparently seeking Lady Zhen’s position as first wife, Guo Nuwang slowly turned Cao Pi against his wife by relating fictional stories about Lady Zhen constantly complaining about him and his neglect, which usually threw the emperor into a temper. After one such episode where Guo Nuwang told him that Lady Zhen had refused to move to the palace he had commanded her to attend, Cao Pi sent envoys to pressure his wife into committing suicide. Guo Nuwang then had Lady Zhen’s body desecrated by having her hair put over her face and rice shells put in her mouth so that she would enter the afterlife blind and mute. Guo Nuwang then became Cao Pi’s first wife where she acted as a shrewd political ally and treated his other concubines with respect as Lady Zhen had. However when Lady Zhen’s son Cao Rui became emperor, another of the consorts told him how his mother had come to die. In a twist of irony Cao Rui had her honoured as an empress dowager, passed honours onto her family but also sent envoys to have her commit suicide, before desecrating her body the way she had his mothers.